Collins Hall, located on east quad, was named after Joel Collins. He served at Miami University for several years in many capacities including superintendent of grounds and college buildings from 1815 to 1827 and as secretary to the Board of Trustees from 1822 to 1855. Upon election to the General Assembly of the State of Ohio, Collins vote prevented the removal of Miami University to Cincinnati. He was also a member of the State House of Representatives and the State Senate and was captain of the Ohio Militia. A full building renovation was completed in 2015. Collins Hall is conveniently located close to Garden Commons Dining Center. Dennison Hall was named after William Dennison from the class of 1835 who was a well-known politician of Ohio and the United States during the second half of the 1800’s. His positions included State Senator, Presidential Elector, Governor of Ohio from 1860 to 1864, and Postmaster General under Abraham Lincoln. A full building renovation was completed in 2015. Dennison Hall is located on East Quad and is conveniently located close to Garden Commons Dining Center. Dorsey Hall was named for James Maxwell Dorsey who established and taught the first school on the University grounds, supervised the construction of Miami’s first building and served as the first treasurer of the University. The location for construction of this building was altered to prevent the removal of a magnificent bald cypress tree, which still stands there today. A full building renovation was completed in 2015. Dorsey Hall is located on east quad and close to Garden Commons Dining Center. McBride Hall was named for James McBride who was the first secretary to the Board of Trustees at Miami University from 1809 to 1820. In 1821 he was elected to the Board and served until his death in 1859. During that time he also served as President of the Board in 1842 and again from 1852-1859. McBride was also a member of the Ohio House of Representatives and a leader of the Whig Party. A full building renovation was completed in 2015. The hall is located on east quad and is conveniently close to Garden Commons Dining Center. 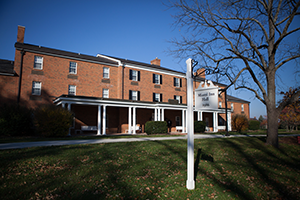 The Miami Inn was acquired by Miami University in 1991 and provided hotel and meeting rooms until June 2012. Conveniently located near academic buildings and athletic facilities, each double occupancy room contains a private bathroom. The building also features a home theater room, and living room with fireplace. It is located a short distance from Garden Commons Dining Center and Armstrong Student Center. Symmes Hall was named for Judge John Cleves Symmes in 1949. He was a pioneer of southwestern Ohio in the late 1700’s. He also required that a township be set aside for an academy for which Oxford became the site of Miami University as a result of his 1788 purchase of one million acres between the Great Miami and Little Miami Rivers. A full building renovation was completed in 2015. Symmes Hall is located on east quad and is conveniently located right next door to Garden Commons Dining Center.